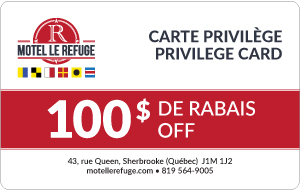 Situated near Bishop’s University in Sherbrooke, the Motel Le Refuge provides the finest experience to couples, families and business people who come to the Eastern Townships. Come and enjoy our affordable, good quality rooms. Whatever the season, the Eastern Townships offer beautiful landscapes as well as many different attractions. At night, return to the comfort of your room at the Motel Le Refuge, the perfect place to relax in peace. Receive a privilege card with any room reservation!